The Federal Railroad Administration issued a final rule on Nov. 21 establishing what it calls “modern, performance-based safety standards for railroad passenger equipment” while also “paving the way” for high-speed passenger train travel as fast as 220 miles per hour. The agency also issued a third quarter “status report” on Nov. 21 that updated railroad compliance rates with positive train control or PTC technology implementation; technology mandated for deployment by Dec. 31 this year. FRA noted in a statement that its passenger equipment safety standards final rule defines a new category of high-speed rail operations and makes it possible for high-speed rail to utilize existing infrastructure, thus saving the expense of building new rail lines. Those new ‘Tier III’ passenger trains can operate over such shared track at conventional speeds as well as up to 220 mph in areas with exclusive rights-of-way and without grade crossings. The final rule continues to define ‘Tier I’ as trains operating in shared rights-of-way at speeds up to 125 mph, while ‘Tier II’ trains are defined as those traveling between 125 and 160 mph; an increase from the previous 150 mph limit. 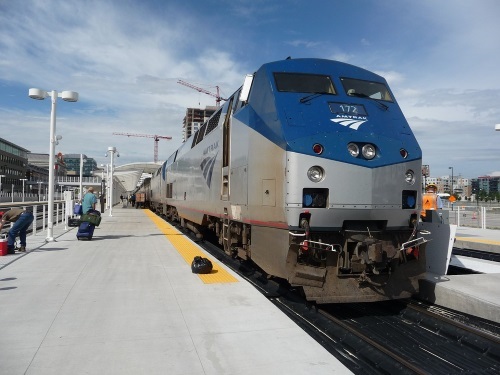 This supports a “competitive operating environment” for U.S. companies seeking to offer travelers more passenger rail options and, by enabling the use of advanced equipment-safety technologies, it helps eliminate the need for waivers. The agency added that this final rule also establishes minimum safety standards for these trains, focusing on core, structural, and critical system design criteria. Meanwhile, in its third quarter PTC implementation update, FRA said 24 railroads have installed 100 percent of the hardware required for implementation, while 11 others have installed between 95 and 99 percent of the required hardware. All railroads using radio spectrum-based PTC have acquired sufficient spectrum, FRA noted. The agency noted that any railroad with less than 95 percent PTC system hardware installation is considered to be “at risk” of not meeting either the Congressionally-mandated deadline of Dec. 31 or meeting the “statutory criteria” necessary to qualify for the “alternative schedule,” which has a compliance deadline of Dec. 31, 2020. Currently, FRA said five railroads are “at risk” for non-compliance with the PTC implementation deadline: The Capital Metropolitan Transportation Authority, Altamont Corridor Express, New Jersey Transit, Peninsula Corridor Joint Powers Board or Caltrain, and the National Railroad Passenger Corporation, more commonly known as Amtrak. Together, they own or control approximately 1,302 route miles of the 58,000 route-miles subject to the PTC statutory mandate, the agency pointed out. FRA added that it continues to track at-risk railroad PTC implementation progress on a month-by-month basis at https://www.fra.dot.gov/Media/File/1326.